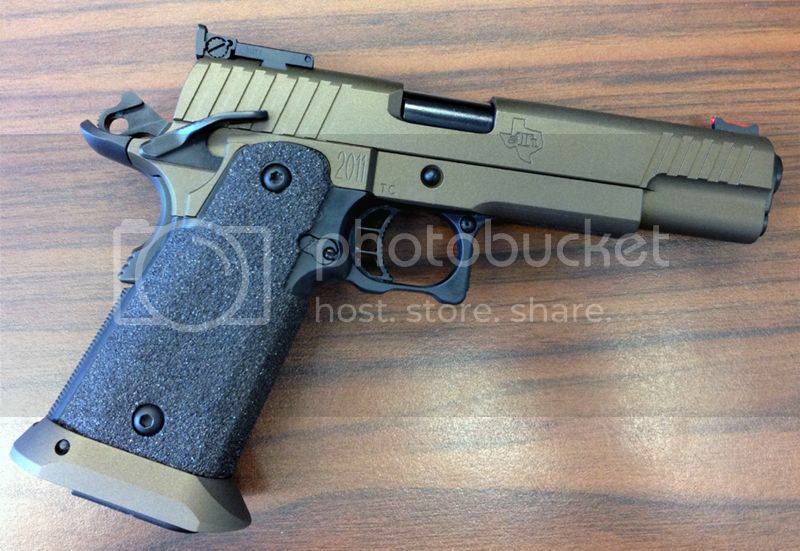 Custom "graphite bronze" Cerakoted Eagle 5.0 - The Gallery - Brian Enos's Forums... Maku mozo! Purchased my first 2011 a few months back and was worried about rust forming on the blued surfaces during the summer months of competition shooting. After reading rave reviews of Cerakote I decided I'd give it a try.. 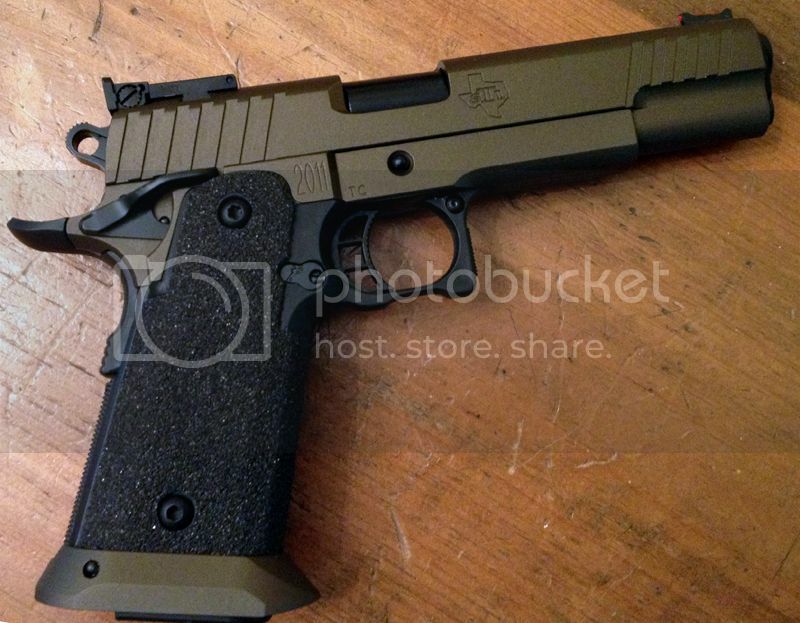 I just wanted to share a few pictures of my pistols transformation with everyone and get feedback on the custom graphite bronze color I applied last week. 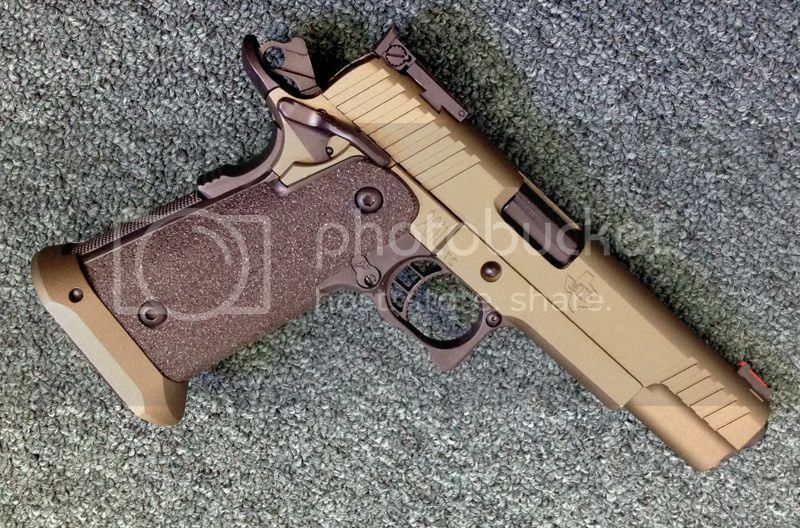 I have always liked the Burnt Bronze Cerakote finish seen often on different weapon platforms. I also have seen a few different companies that are marketing a darker blend of the Burnt Bronze. This really appealed to me as the standard burnt bronze color appeared to be a bit to "blingy" for my tastes so I wanted to "darken it up a bit". Finally the "graphite bronze" color. Simply put, I mixed Graphite Black with Burnt Bronze to achieve a slightly more subdued tone. The cool thing about this new darker shade of the Burnt Bronze is how drastically it changes color in different lights. I think it turned out pretty cool - not sure if I'm going to keep it this color but non the less, it came out very interesting. What do you all think? Thanks for your feedback! Looks really good! Who's magwell is that? Standard STI I milled .050" off each side and .060" off the bottom. All to make it fit the IDPA box. Looks pretty cool to me. I like the two tone look. I think it looks great. I like the color in the sun the best, more contrast. Leave it that color it looks good and is different than a run of the mill 2011. Awesome. How hard was it? Applying the Cerakote had a learning curve. I tried applying Cerakote with my standard airbrush that I've used for years applying KG Industries Gunkote 2400 series. The first few tries didn't go so well...I had to much material drying prior to hitting the surface and ended up with a very rough finish or if I had the correct volume, it was not covering enough area and I would end up with uneven streaks. So after several conversations with NIC reps, I invested in a recommended HVLP mini touch up gun. From there, it has been smooth sailing. The material goes on smooth and has a even appearance. It did smooth out the action slightly, the slide truly feels like its on ball bearings now. Very nice! Love the stealth black color as well. Looks Awesome!! What ratio of Black and Bronze did you use? 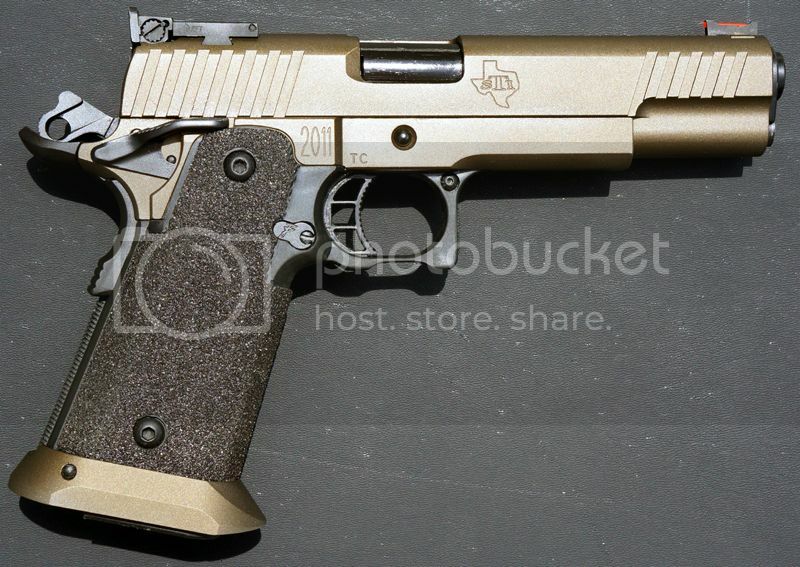 I'm looking at refinshing my SBR it's Patriot Brown now and I really like that "Graphite Bronze"
That is freakin' nice! Love the color. Hello Adam, sorry for the late response. I hardly ever check back here to read the comments. I tried 10% bronze & then 20%. 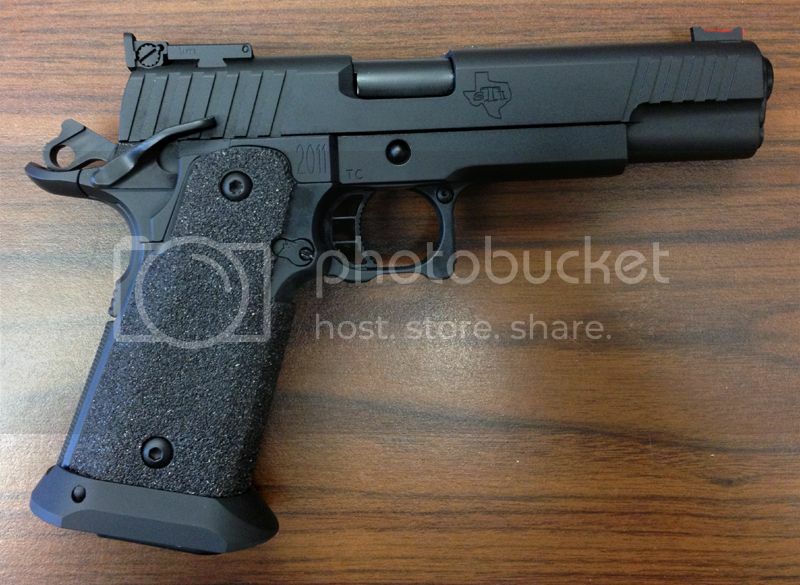 I ended up liking15% the best and that's what was sprayed on this gun. My Version and I really Like the Color!! Thanks for the inspiration! 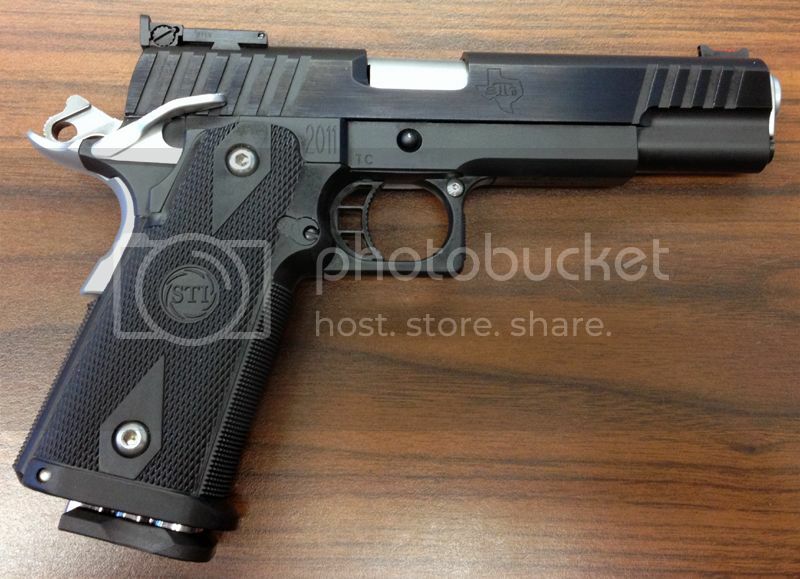 Yes the two tone looks awesome, wouldnt change a thing. Love it, the factory color scheme was boring, but not now after you worked your magic. Those are some are some sweet guns!!! Just saw this. Your project turned out great! I really like the color. 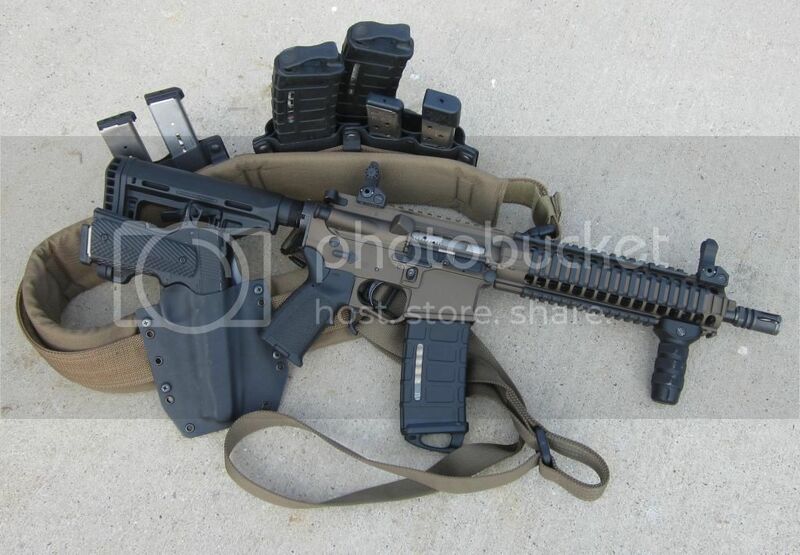 I am planning a build and this gives me some ideas. Is the grip skate taped or did you do aluminum oxide on it? I can't tell from the pics.